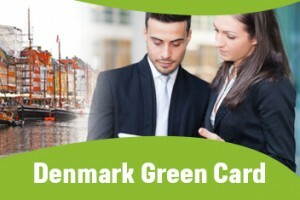 Denmark Immigration Green Card Scheme – Denmark is known to be one the happiest nation in the world. This European country is highly acclaimed for creating full living conditions; it is also known for its Greenland’s and eco-friendly approach and better eco-system for a diversified social environment. The increasing trend of the multi-cultural population has permeated to Denmark, like other and European and American nations that have been widely through opportunities for foreign nationals through different Visa programs. Denmark is offering world class infrastructure and healthy environment to international professionals. To facilitate foreign nationals with highest possible services Danish Immigration Service has introduced a Visa service called Green Card Scheme; it has become the most valid Visa among all the immigration schemes proposed by Denmark. The Green Card Scheme designed by the Denmark is framed to attract the qualified professionals from different parts of the world. This Visa permits three-year residence for the applicants. This card is issued based on the point based tests, to assess the skill set and abilities of applicants to find a suitable job in Denmark. To be eligible for this program, applicants must secure 100 points during the assessment. The points are calculated from various categories such as criteria of Age, education, work experience, language ability and adaptability. Masters degree is the mandatory requirement, to be eligible for Green Card scheme. 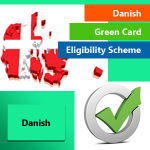 Denmark Green card scheme assessed through a systemic procedure; Denmark Immigration Points Calculator imparts points to the applicants. The highest points is awarded if your profile suits the standards. The points are calculated based on the Age: 15 points, Education: 80 points, Work Experience: 15 points Language Skills: 20 points, adaptability: 10 points, the candidates must score 100 points to get the Green card. You and your complete family willing to settle in Denmark must have a full health insurance until you covered under Denmark National Health Scheme. You must show the proof of funds in your bank to support yourself in Denmark. Danish Green Card, Denmark Immigraton Consultants, Work in Denmark Danish Green Card Scheme, Danish Immigration Service in India, Denmark Immigration points calculator, Work Permit to Denmark. permalink.